Years ago, many years ago, when we still lived in Chicago, one of our favorite restaurants was Vinci on Halsted. We went many times with friends or just for a date night. 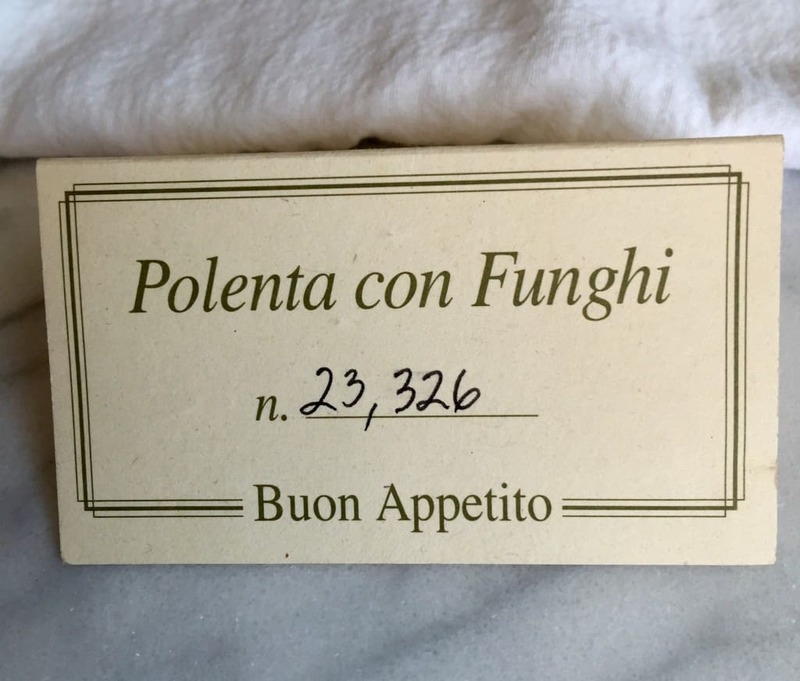 They had an appetizer on the menu, Polenta con Funghi. 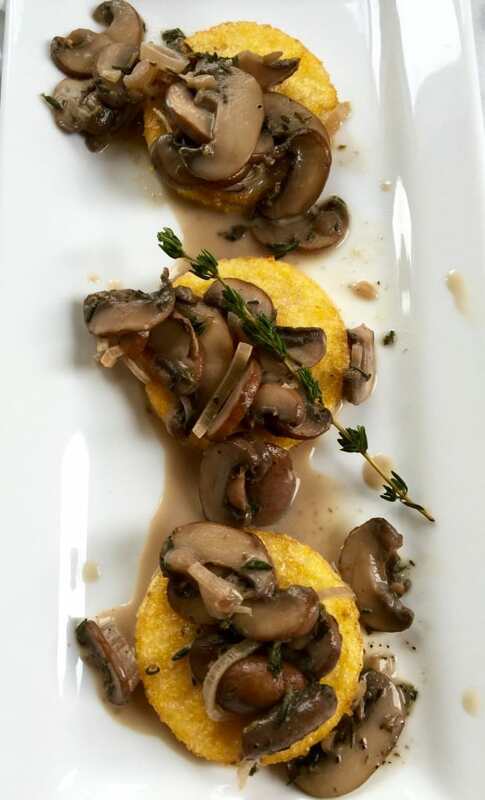 We always started with this polenta and mushroom appetizer. The waiter would bring it out and put a card on the table with the number of times it had been served. I still have that card from one of our visits. Our good friend, Carol, wrote her balsamic berry sauce recipe on the back of the card. Such great times and memories. I had some leftover polenta so I thought I’d try making something similar. I froze my leftover polenta, thinking I could thaw it and slice it. Not a good idea. It was super watery and fell apart in the frying pan. 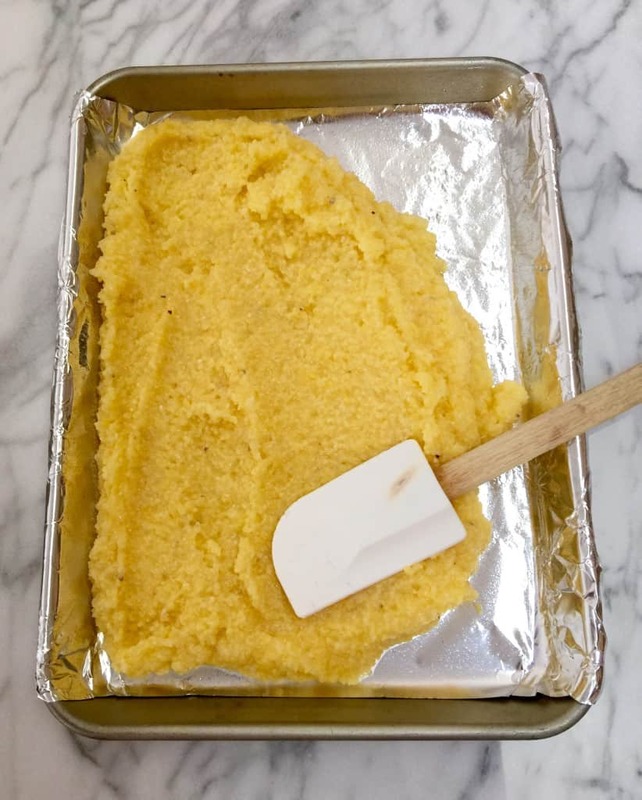 This time I just made a batch of basic polenta, spread it in a pan and chilled it a few hours. Much better that way. 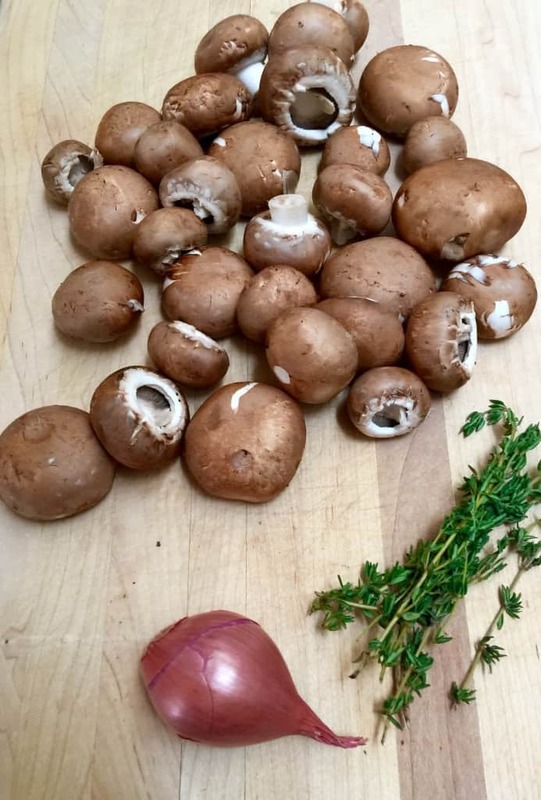 We like cremini mushrooms but you could certainly use whatever kind you like, or even a mix of mushrooms. I added a little shallot, fresh thyme, wine and chicken stock and finished it off with a little heavy cream. 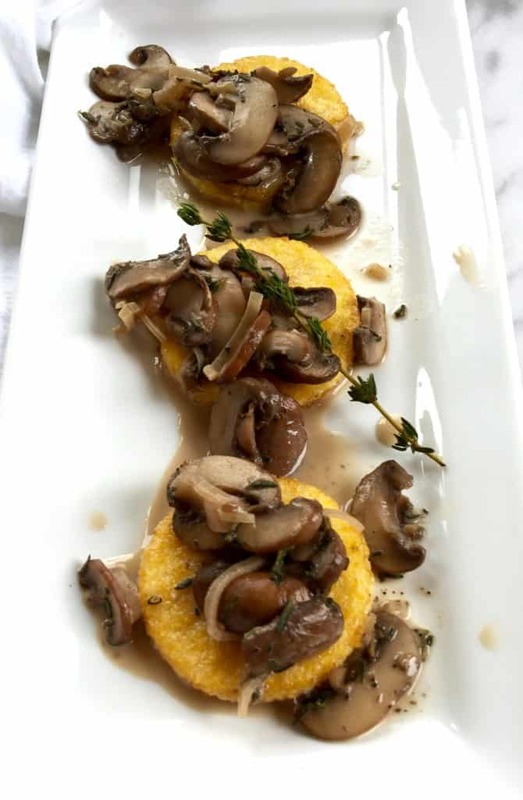 The polenta was cut into rounds and fried in olive oil and butter, then topped with the mushrooms, delicious. It was dinner last night along with some roasted cauliflower. Yep, Meathead went vegetarian! This is an easy and flavorful dish, great for guests or just for lunch or dinner with a green salad. I savor each bite and think of home, friends and Vinci on Halsted. Make basic polenta: Bring 4 cups water to a boil and then add a good pinch of salt. Slowly whisk in 1 cup polenta, whisking, or stirring constantly with a wooden spoon, until starting to thicken, a few minutes. Turn heat down to low, and cook for about 40 minutes, stirring occasionally. It should be very thick and fully cooked and “bloomed”. Cool slightly and then spread evenly in a 9 X 12-inch sheet pan that has been lightly sprayed. Let cool completely and then cover with plastic wrap and refrigerate at least 2 hours or longer, preferably overnight. 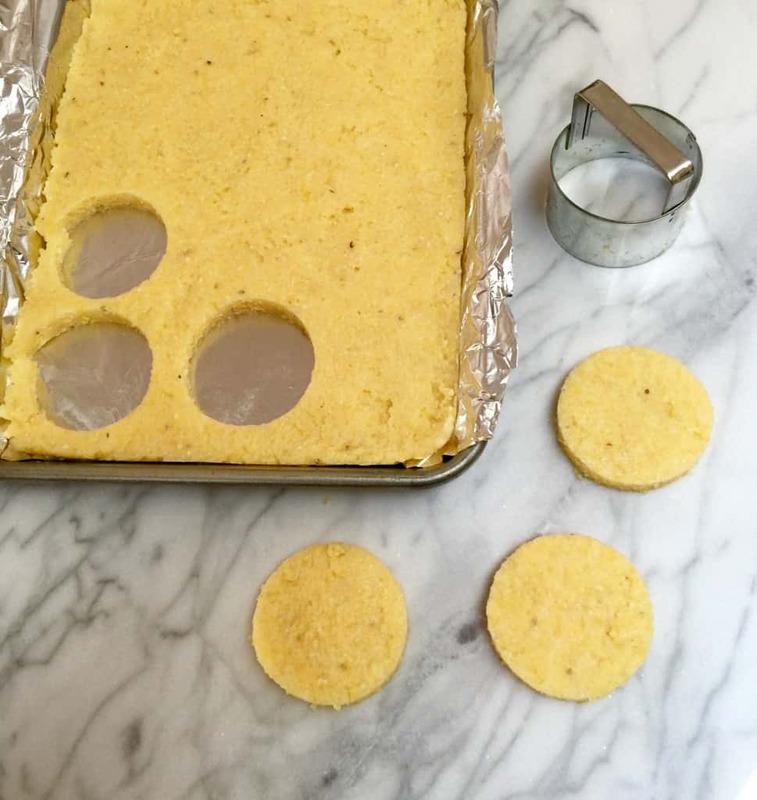 Cut polenta into desired shapes. I used a round cookie cutter (you could cut triangles or squares, whatever you like). Set aside and make mushrooms. In a large skillet, heat 1 T olive oil and 1 T butter over medium heat. 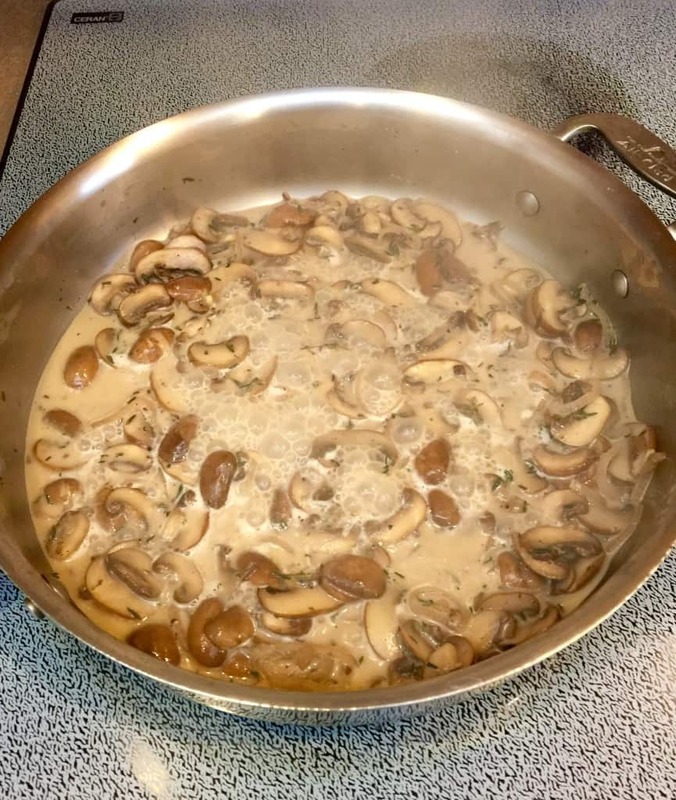 Add the mushrooms and thyme and cook until most of the liquid has evaporated and the mushrooms are glossy. Add the sliced shallots to the pan, season with salt and pepper, and cook another 2 – 3 minutes. Add the wine and chicken stock and turn up heat and cook until reduced by half. Lastly, stir in the cream and let simmer a minute or two until incorporated and slightly thickened. Taste for salt, add more cracked pepper. In the meantime, in a nonstick skillet heat about 2 tablespoons of olive oil and 2 tablespoons butter (I eyeball this). 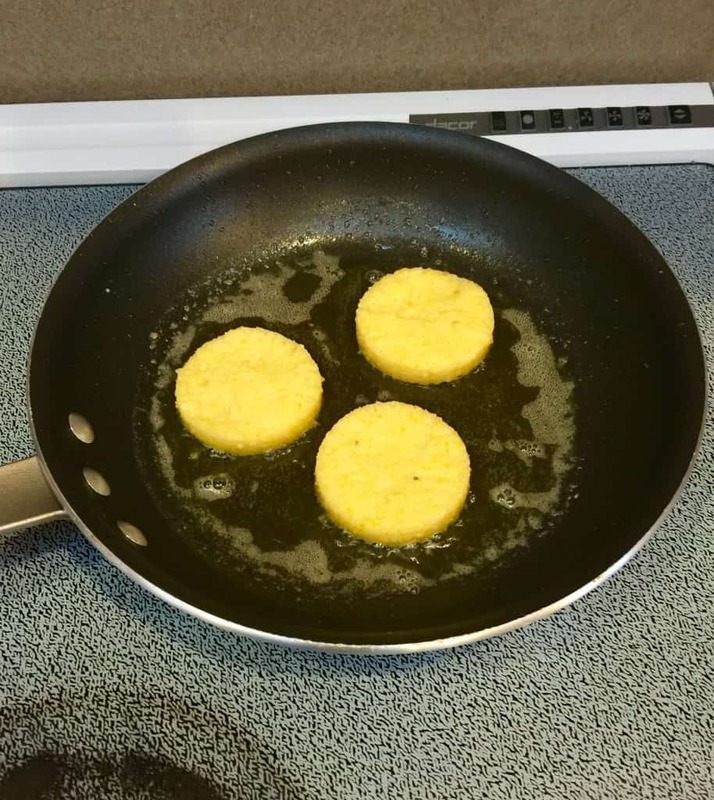 Carefully add the polenta rounds and cook until lightly browned and crisped, and center is still soft, about 5 or 6 minutes a side. Careful, lots of sputtering, sorry, but frying is messy! Drain on paper towel-lined plate. To serve, place 1 or 2 rounds on a plate, spoon mushroom mixture over polenta and sprinkle with chopped parsley. Enjoy. “Polenta con Funghi!” I exclaimed, after turning left into oncoming traffic on an unmarked one-way street. Ha ha Mark!! You crack me up. This looks fabulous Kelly! We have good friends who are gluten-free/celiac. This would work. It’s another one I’m making very soon. Thanks Kelly-you rock. We made this last weekend. It was as fabulous as you make it appear, Kelly. It was easy too! I think I’ll make it again this weekend. Cheers! Glad you liked it. It is yummy.